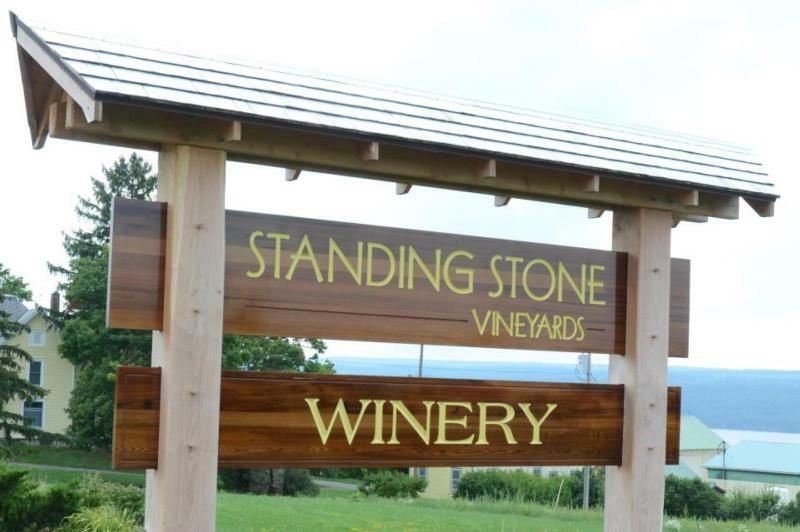 Standing Stone Vineyards is the realization of a vision – to grow and craft world class Riesling and Gewurztraminer in the Finger Lakes. That vision led Tom and Marti Macinski to this very special farm, originally planted by Gold Seal Vineyards in the early 1970s. The planting of Riesling and Chardonnay was preceded by 3 years of research on sites throughout the Finger Lakes, by industry leaders Charles Fournier and Guy DeVeaux. The Gold Seal research and planting, and Macinski's vision of world class wines contributed to the Finger Lakes recognition as a world class wine growing region. In 1991, we purchased historic vineyards on the east side of Seneca Lake. A long line of venerable vintners spent years researching the quality of these lands. We followed in their footsteps by growing wines in the same historic vineyards that served Gold Seal Vineyards so well in the past. History became our best teacher, for conditions on the rolling hillsides above Seneca Lake proved ideal for growing and harvesting premium grapes and subsequently crafting heavenly wines. In just a few short years, our boutique winery began to make history with a prized selection of award-winning wines. Our wines continue to reap honors and critical acclaim on the wine circuit, but we've only just begun to show our potential. We plan to move into the history of the future, with the great vineyards of the world, bringing much deserved recognition to the new world-class wines of the Finger Lakes. From ripe, richly flavored grapes we produce premium wines – each year making slightly more wine which is better than the preceding vintage. Our first crush, in 1993, yielded only 800 cases, which was quickly discovered and sold out in just 12 short weeks. We now produce about 8000 cases, allowing us to bring wine to you in more locations. We always encourage you to visit the winery, drink in the view, and enjoy the current vintage. Tour our 41 acres of vineyards. Learn how we carefully nurture the fruit of the vine through the fall and winter, and into summer, in a way that allows the best features of that fruit to show through in the finished wine. The wines are made and sold in renovated barns. The white wines are made in stainless steel tanks, allowing temperature control of fermentation and cellaring, and the red wines and Chardonnay are made in oak barrels – primarily American Oak. We spend many hours tasting the wines, both to follow their progress, and to assess the blends. We believe that the hands-on, vineyard based approach to our wines results in a superior wine finished in the bottle. You can tour our facility, often including a visit with someone from the winemaking team, and often including samples of the current vintage from barrels or tanks. The Wine This Vidal Blanc Dessert Wine balances bright and pure acidity with sweetness and fruit on the palate. With notes of pineapple, honeydew melon, mango and honeysuckle it has a pleasing and fresh finish. Pair with stone fruit tarts or enjoy on its own as a sweet but invigorating treat. "40-year-old vines – one of the oldest Chardonnay vineyards in the Finger Lakes. Aromas of pear and ripe melon lead to a full, round mouth feel, and a delightfully crisp, elegant finish. We serve this wine with creamy cheeses, seafood dishes or chicken, or with buttered, salty popcorn for a snack." Tasting Notes: Light honey, melon flavors, bright fruit.Cheese Pairing: Blue cheese, Roquefort, Stilton, goat cheeses, smoked gouda,Food Pairing: Pate, smoked meats, dried fruit, and Crème Brulée. Wine Spectator 90"An enticing sweet wine, with lush mango, creamed apricot and candied orange peel notes melding together and carrying through the maple-accented finish. Drink now through 2020. 190 cases made." ~J.M. Wine Spectator 90"This has a very tangy streak of citrus peel and persimmon running through the core of tangerine, date and salted caramel flavors. Still taut on the finish, but should mellow out nicely with some cellaring, as the length is there." ~ J.M.